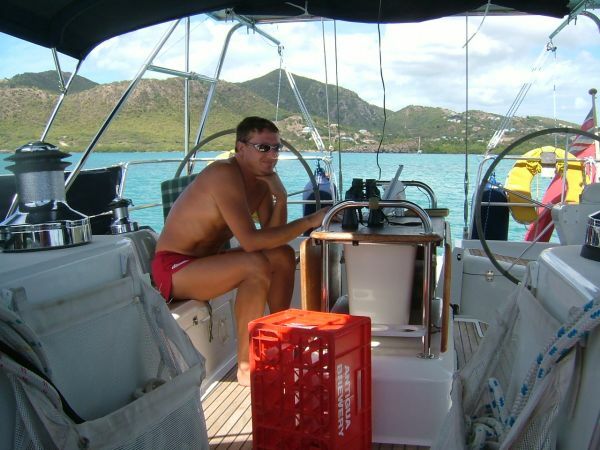 George is back on board and we are comfortably anchored again in Falmouth Harbour, Antigua, which regular bloggers will know as the home of the megayachts. We had a little excitement on Tuesday morning at about 0530 (!) There was a strange rumbling noise which we heard through the hull for ten seconds or so. Coincidentally having read the pilot book about seismic activity in the Dominica channel, I immediately identified this as an earthquake. This was strangely correct, but the epicentre was just 15 miles away between here and Montserrat - a 5.3 richter apparently and very unusual. Nothing since and we hope an isolated incident. We decided to upgrade the plotter software last week (a normal simple procedure - net download etc.) However, the warranty works in Lagos last October seem to have deleted the plotter serial number so that it will not accept upgrades or indeed anything else. As I write, the plotter has been removed and is in the care of Signal Locker, Nelson's Dockyard, en route to the USA for repair by Raymarine. Hmmmmm ! On the positive side, we have had the rig tensioned a little and Greg Outboards has finally got the Yamaha outboard to work properly. So right now we're sitting around with not much to do. We have taken some video of Falmouth Harbour including megayachts and we'll take a bit of the Dockyard too and post that on the website in the usual way. We have a few jobs which we can get on with and we can visit a few known anchorages, where we're comfy without the plotter. We may also commission a few more bits of work. ’Tis hard to settle order once again. Thro’ many a woven acanthus-wreath divine! We hope you enjoyed that: G thought we should miss out the Choric Song, but hey, a ten minute poetry break never hurt anyone. Don't worry, the most mind-altering consumumption is ice-cold beer and that does not generally induce melancholy, anyway, we will do some more wandering on the oceans, not to mention returning home someday.